If you want to hatch baby chicks from the eggs your hens lay, you'll definitely need to have a rooster around to fertilize the eggs. But if your goal is just to increase the egg production from your backyard flocks, a rooster won't do anything to increase their production. In fact, the hens will do just as well on their own if you ensure they are healthy, comfortable and well-fed. Egg production in hens is stimulated by increasing the amount of light they receive. The egg production will occur whether a rooster is in the flock or not. 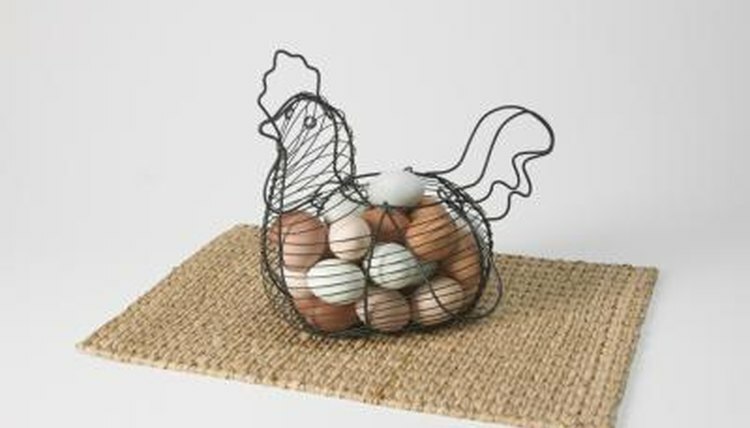 So, when the days begin to get longer in the spring and summer, your hen will naturally lay more eggs. Hens need between 14 and 16 hours of light a day for best egg production. But expect your hen to lay less or even stop when the days are shorter. If your goal is to have your hens lay more eggs, scrutinize their overall situation. First of all, its important to know that most hens lay well for two or three years. After that time, their egg production slows down considerably. So your hens may continue to lay -- just less often -- if they are in good health and are well taken care of. Even when the light is adequate for your hens to lay eggs, other factors can disrupt their egg-laying cycles. For example, being without feed or water for several hours can cause your hens to stop laying for a while. Excessively hot or cold weather can affect egg production, as well. Some people find that moving hens to a new place can stop the eggs until they become accustomed to the surroundings. Hens should be in the peak of health to produce eggs on a regular basis. It’s important to ensure that they don’t have any underlying health problems. External parasites such as lice and mites, or internal parasites such as worms, can affect your hens' health enough to slow or stop egg production. Any other illnesses, such as respiratory infection, can cause hens to stop laying eggs.